ATLANTA -- San Francisco Giants reliever Derek Law was optioned to the minors on Tuesday, a day after facing six batters without getting an out in the series opener against the Atlanta Braves. The Giants recalled right-hander Kyle Crick from Triple-A Sacramento, giving the former first-round draft pick his initial taste of the big leagues. Law came on in the eighth inning Monday night with the Giants trailing 3-0, two runners aboard and two outs. He walked Tyler Flowers and then gave up five straight hits -- including a towering, three-run homer into the second deck in right field by pinch-hitter Danny Santana -- as the Braves cruised to a 9-0 victory. With the dismal outing, Law's ERA climbed from 4.20 to 5.40, prompting the Giants to send him to Sacramento. The Giants are eager to see what Crick can do. He was a first-round pick in 2011 out of high school but took a while to develop. Crick's progress stalled at Double-A Richmond, where he spent three seasons primarily as a starter. But he made a positive impression on the Giants in spring training this year, shifted to the bullpen at Sacramento and finally began to fulfill his potential at age 24. In 24 appearances for the Triple-A team, Crick was 1-2 with a 2.76 ERA and six saves, recording 39 strikeouts in 29 1/3 innings. 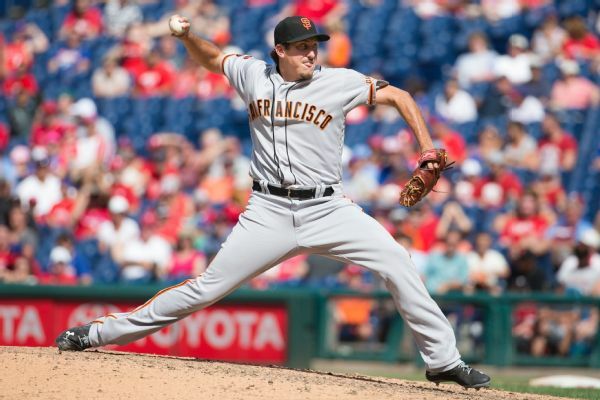 "He's made tremendous progress this year," manager Bruce Bochy said. "He's really matured, not just as a player but as a person. He's really grown up." The 26-year-old Law got off to a solid start this season and actually filled in as the closer when Mark Melancon was injured, earning four saves. But Law's last three appearances were dismal. In two-plus innings, the right-hander surrendered 11 hits and eight runs. Given the sorry state of the Giants' bullpen, which is a man down while Hunter Strickland serves a six-game suspension for a brawl with Bryce Harper, Bochy couldn't afford to keep Law in the big leagues. "We need to get him right," the manager said. "He's really struggling with his command. Occasionally, this happens. We need to give him a little break."